"In Joe Wade Formicola’s loving memory, the Formicola family wanted to honor what he was passionate about. In his youth, a mentor recognized Joe Wade Formicola’s unique vocal qualities and urged him to enter the field of broadcasting. 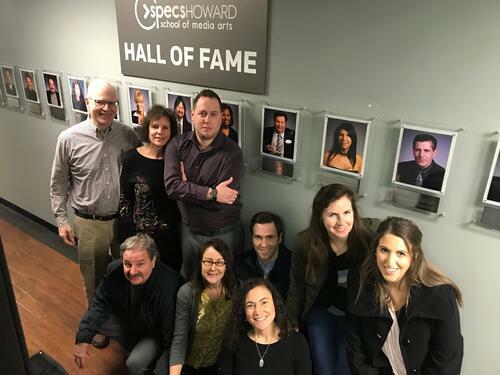 Joe was fortunate that his Italian born grandfather helped supplement some of his tuition so that he could attend and graduate from the Specs Howard School of Broadcasting in 1970, which was the launching pad for his long and successful career. Joe loved to share the spotlight as an on-air radio personality. He mentored so many people throughout his career on the ins and outs of broadcasting, and championed many people who he recognized had a passion for radio. Those who knew and loved Joe know how he would want his legacy to be carried on by giving someone an opportunity to have a broadcasting career. Knowing all of this about Joe, the best way to honor his memory would be to assist a budding DJ with their broadcasting career and to honor Joe's greatest passion, and his charitable spirit. All funds raised were donated to "The Joe Wade Formicola Broadcasting Scholarship" at the Specs Howard School of Media Arts. The criteria for receiving the $2,600 grant was for Specs Howard broadcasting students to submit a one page essay on why they wanted a career in broadcasting. The submission could be word format, and/or an audio file or video file. The Formicola family received 11 wonderful submissions from the following broadcasting students. All of the submissions were wonderfully written and/or performed via audio or video and conveyed their individuality and passion for why they want a career in broadcasting. The Formicola family wishes you all great success. After careful review of all the submissions by the Formicola family we proclaim the finalist and winner to be MARGARITE RONAN. Margarite, CONGRATULATIONS! On Friday, February 21, 2019, the Formicola Family came to Specs Howard for the formal check presentation. The family was able to visit Joe's plaque on the 'Specs Howard Hall of Fame'. Scholarship Recipient, Maggie Ronan, was able to read her winning essay and meet the family. Thank you to the Formicola family for their generous scholarship and for changing a student's life forever!